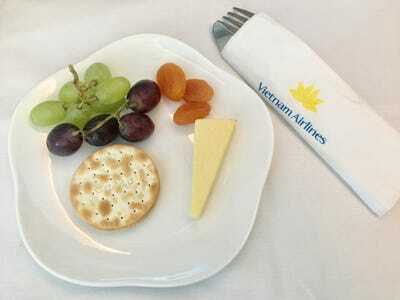 Vietnam Airlines, a Skytrax four-star-rated carrier, is currently the world’s sole airline with direct flights from the UK to Vietnam. 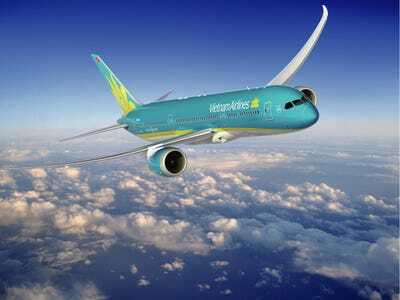 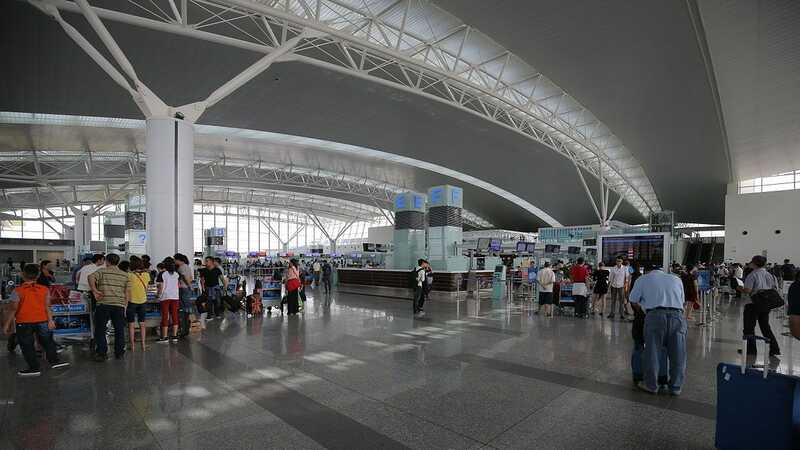 There are daily flights from London Heathrow to major Vietnam hubs Hanoi and Ho Chi Minh City, and with each having a flight time of just under 13 hours, they are also Vietnam Airlines’ longest routes. I had a chance to test the business class product (with rates starting from £1,818 or $US2,344.83) from London to Hanoi on the relatively new Boeing Dreamliner 787-9 plane. 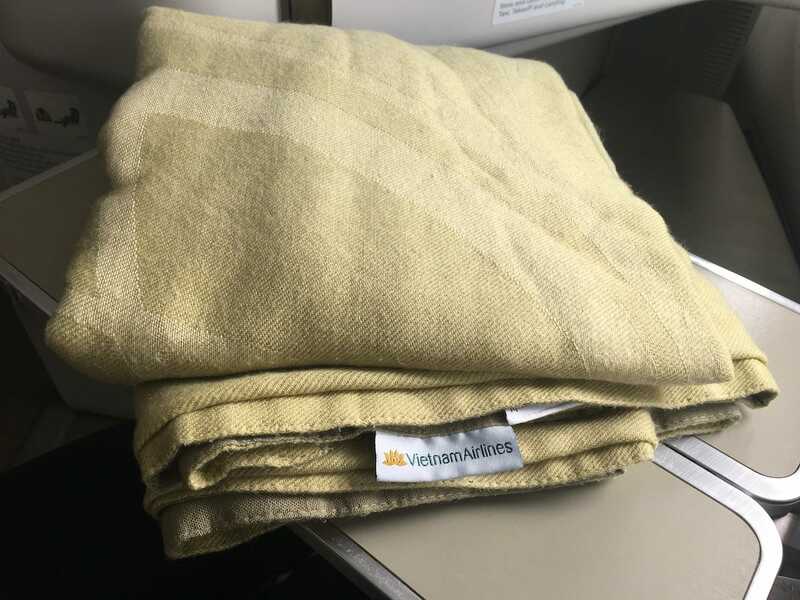 Here’s what to expect in business class on board Vietnam Airlines’ London Heathrow to Hanoi route. 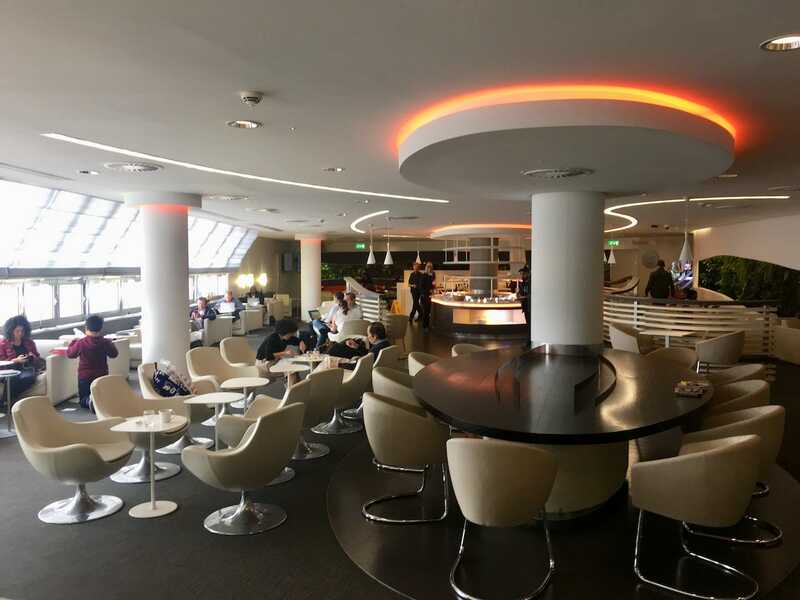 Business class passengers on Vietnam Airlines share space with other SkyTeam Alliance members (such as KLM, Korean Air, and AirFrance) in Terminal 4’s two-level Heathrow Skyteam Lounge. 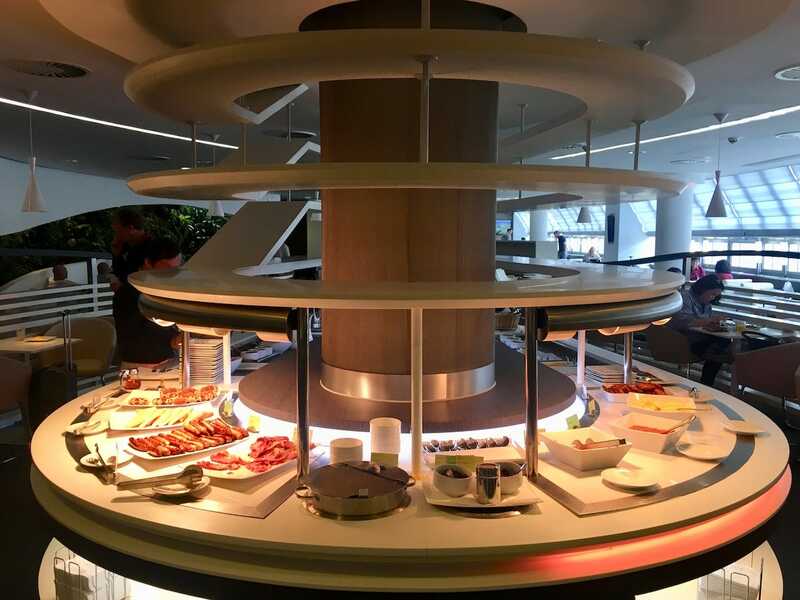 I didn’t have much time to make full use of the lounge’s many amenities — like treatments in the Clarins Spa — but I did sample the breakfast buffet, which contained English breakfast items like bacon, eggs, tomato and baked beans. There were also waffles, sliced fruits and cheeses, and other continental bits. In front of the food buffet counter is an extensive self-serve drinks station, supplying several juices, soft drinks, wines, beers and popular spirits including Jameson, Bacardi, Bailey’s, Gordon’s, and Campari. 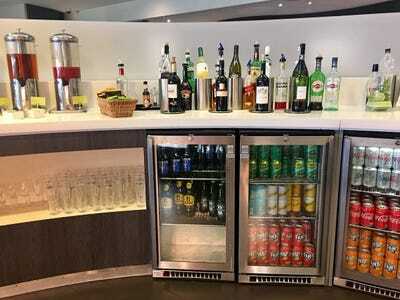 As it was still morning, I decided to hold off on any alcoholic beverage until I was on board the flight. 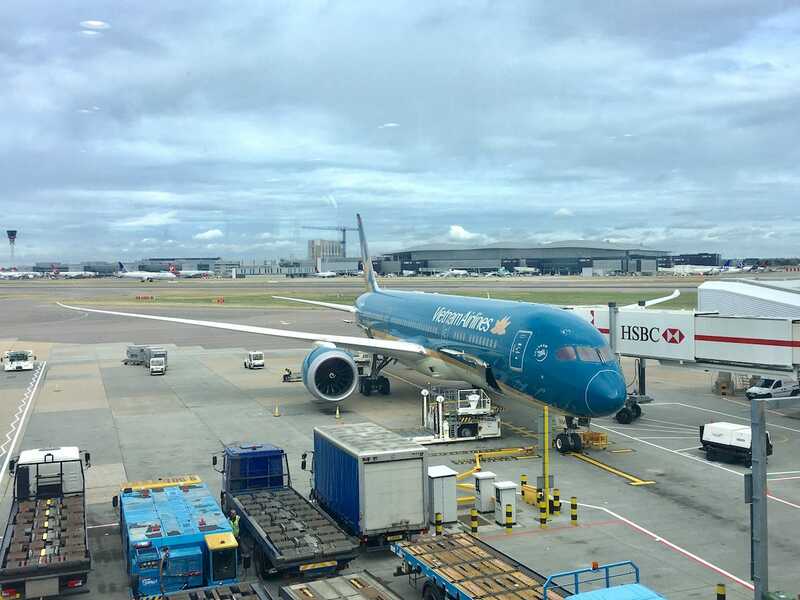 After rushing to the gate from the Skyteam Lounge to ensure I made the flight on time, the boarding process on the Boeing 787-9 Dreamliner ended up being delayed by at least 30 minutes. Eventually, boarding commenced. 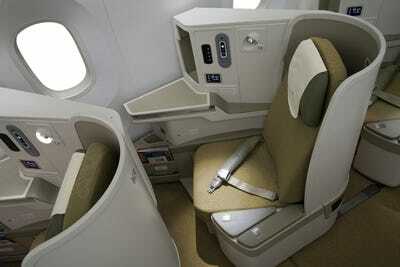 Business class passengers were called first, and I “turned left” towards my window seat. 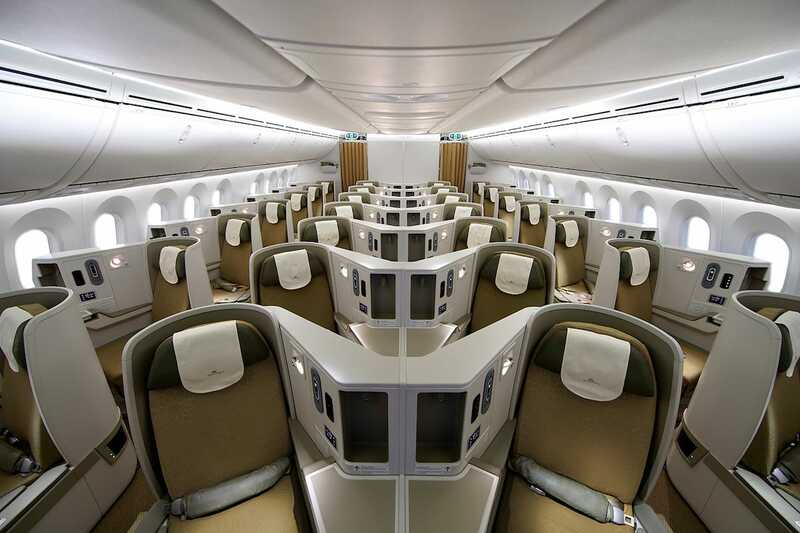 There are 28 business class seats in a herringbone arrangement (1-2-1) and each seat has direct aisle access. 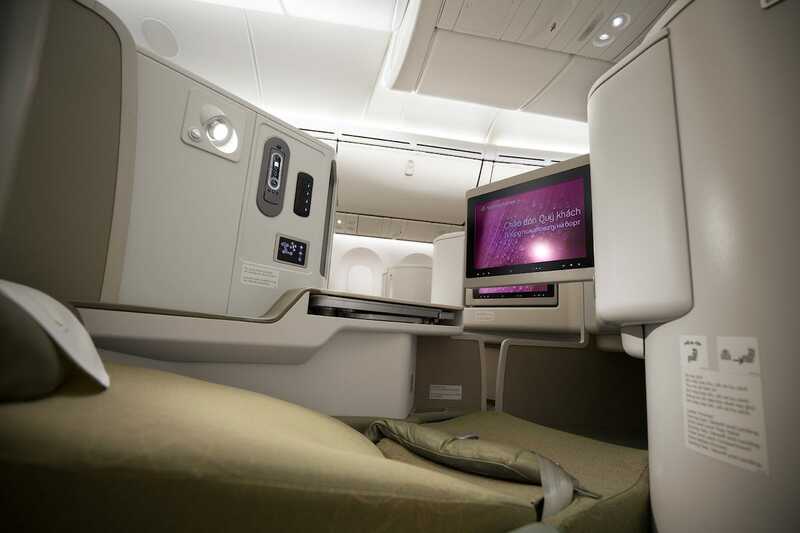 All seats can transform into lie-flat beds, and there was plenty of space for my legs (both sitting and laying) and the storing of my small belongings. 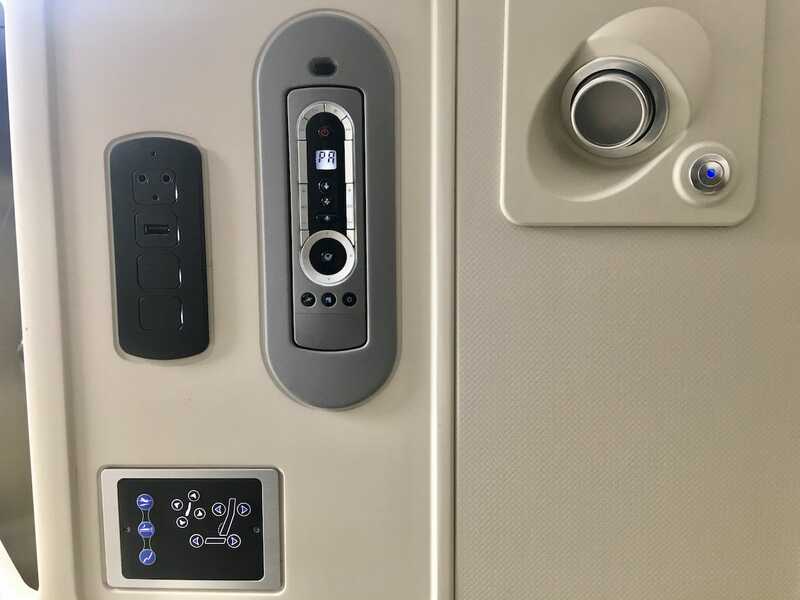 I didn’t particularly agree with the colour palette of the seat and overall section, with the white, brown, and muted green palate making the cabin feel a bit dated and drab. 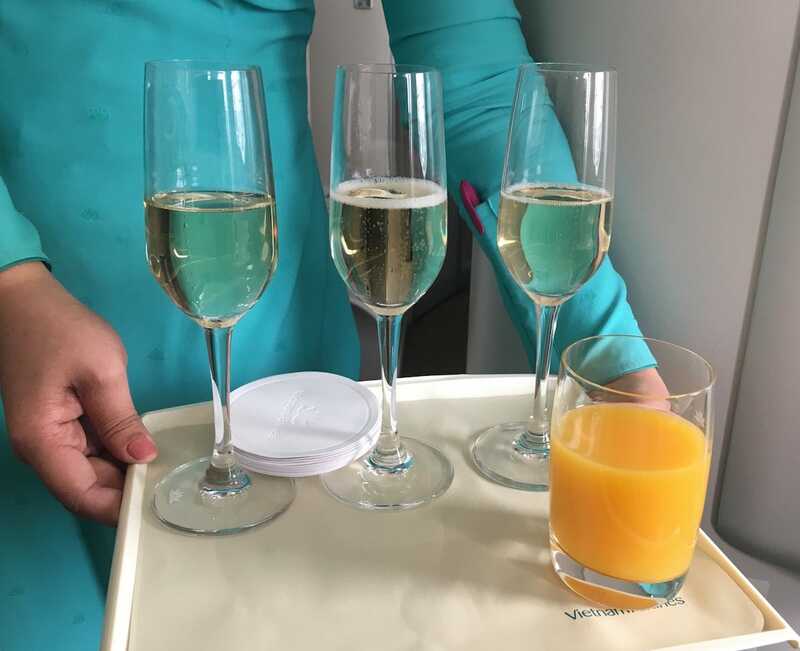 Not too long after settling into my comfortable seat I was offered a “welcome drink” of orange juice and/or sparkling wine by a friendly flight attendant. 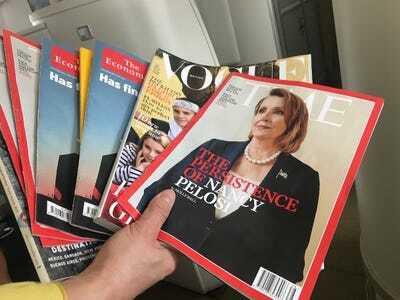 I was also offered updated magazine issues and newspapers — I chose to fuel my wanderlust with Condé Nast Traveller. While still on the ground, passengers received a food and drink menu exclusively for business class passengers. The 12-and-a-half-hour flight included lunch soon after take-off and a breakfast service once we were closer to Hanoi. Nibbles like sandwiches, fruits, cakes, and instant noodles could be ordered during the duration of the flight. 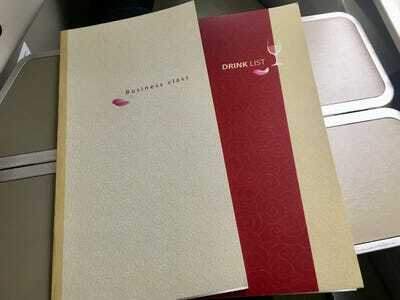 The beverage menu listed many soft drinks, juices, spirits, beers, and special cocktails. The wine list was a bit limited with two reds and two whites but I enjoyed my glasses of Vina Albali 2016, a Spanish white wine. 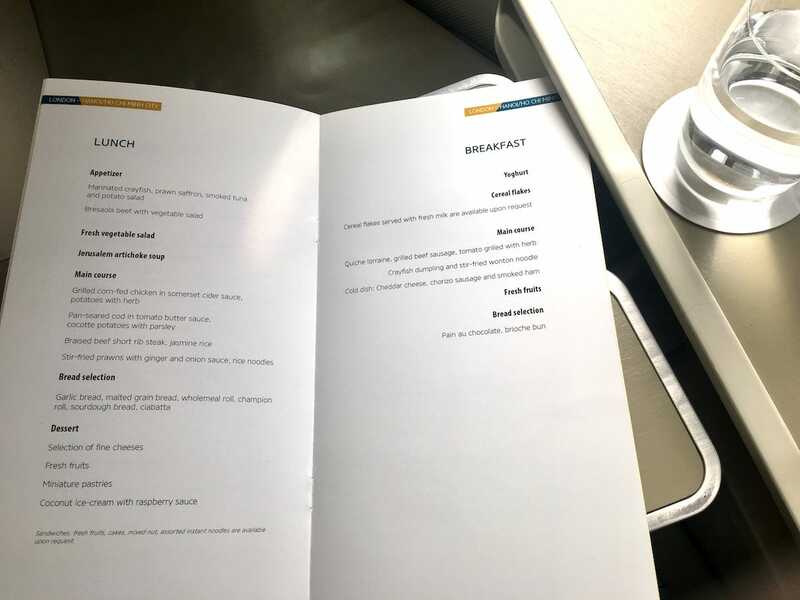 My food and drink order was received and I then took time to explore my seat’s many amenities. 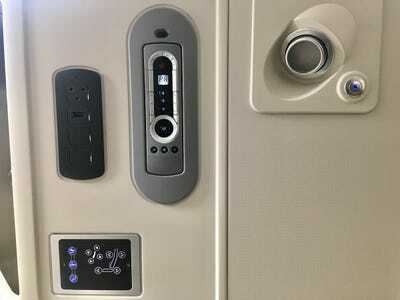 To the right of my seat were adjustable seat/bed controls, a reading light, headphone jack, remote control for the entertainment screen, and a handy USB port. There was also an international power outlet (not pictured). 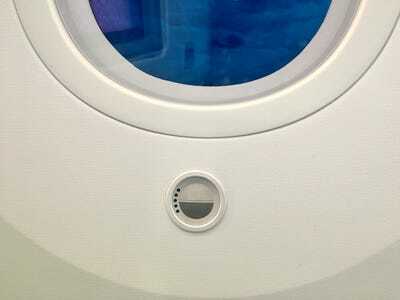 To the side of the panel was another section which stored the airline’s noise-cancelling headphones. 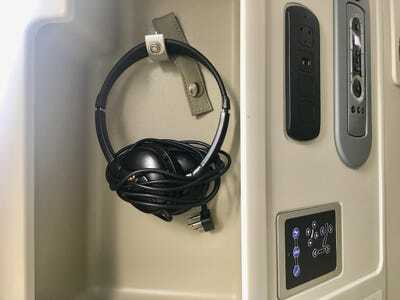 There was enough space for me to turn it into a small storage shelf for a few items and reading materials. Instead of the typical window shade, cabin windows are adjusted electronically, giving passengers a lot more control over the amount of light going through the cabin. 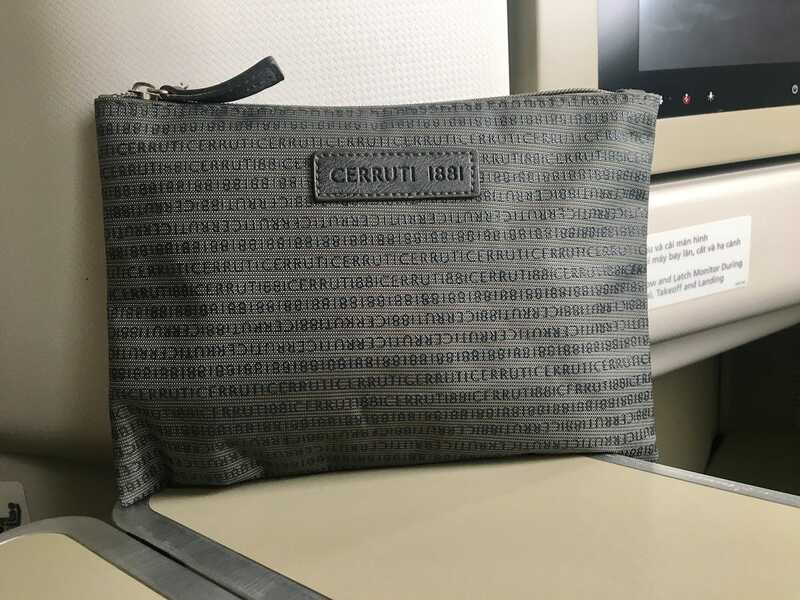 Passengers received an amenity kit by luxe Parisian fashion house Cerruti 1881. 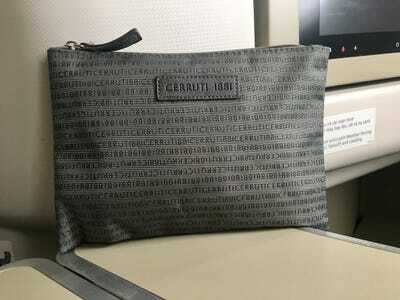 I knew well before the end of the flight that I’d want to keep the understated but stylish pouch for future use. 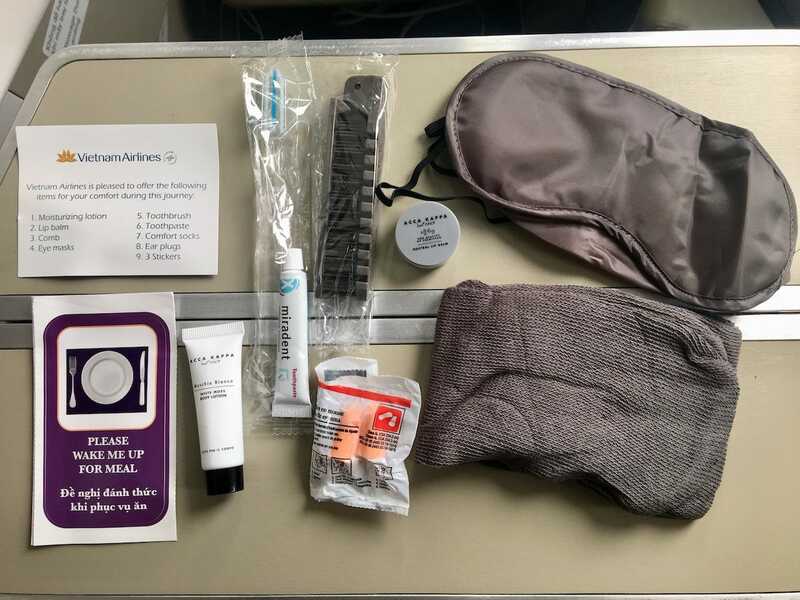 The amenity kit contained an eye mask, compression socks, ear plugs, fun-size toothbrush and toothpaste, body lotion and lip balm by Acca Kappa, and thoughtful stickers to alert the attendants to wake you up (or leave you be) during meal services. 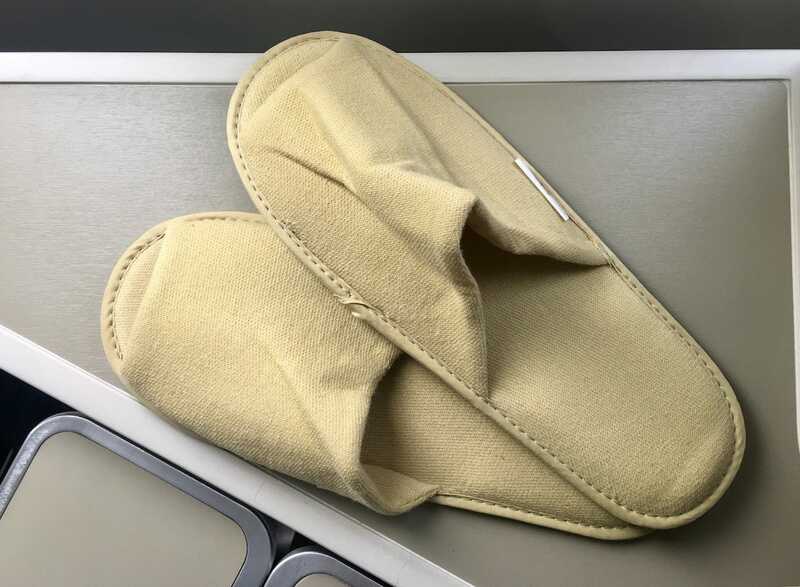 The seat came with a pair of comfortable slippers; I gladly stowed away my own shoes until we landed in Hanoi. I was also given a nice thick blanket. 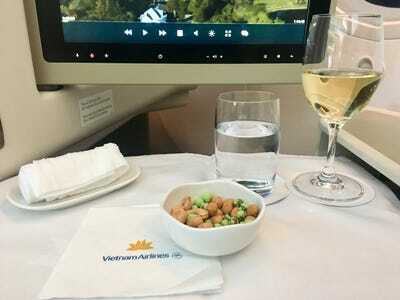 After take-off, my drinks order arrived along with a refresher cloth towel and a small but tasty bowl of cashews and wasabi peanuts to kick off the three-course lunch meal. All business class meals are provided on proper chinaware, with metal utensils and a sturdy cloth napkin. 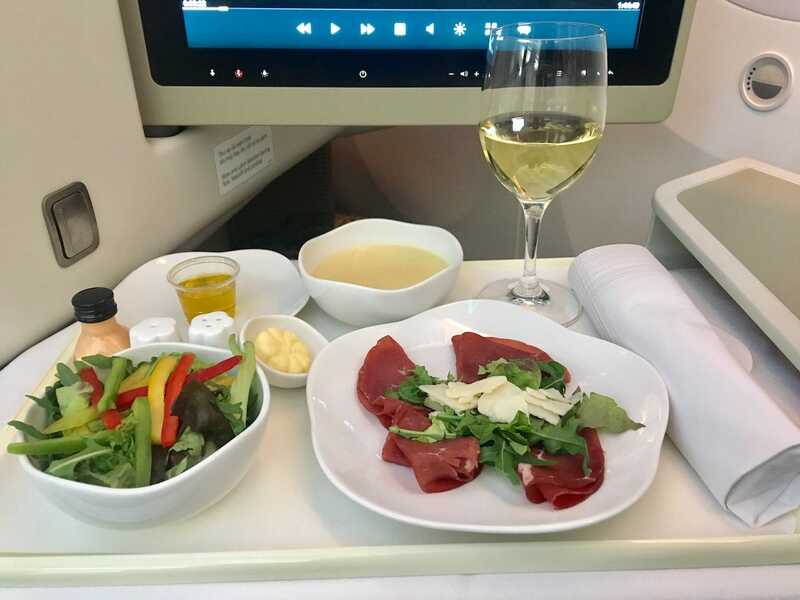 I ordered the bresaola beef with vegetable salad as a starter. 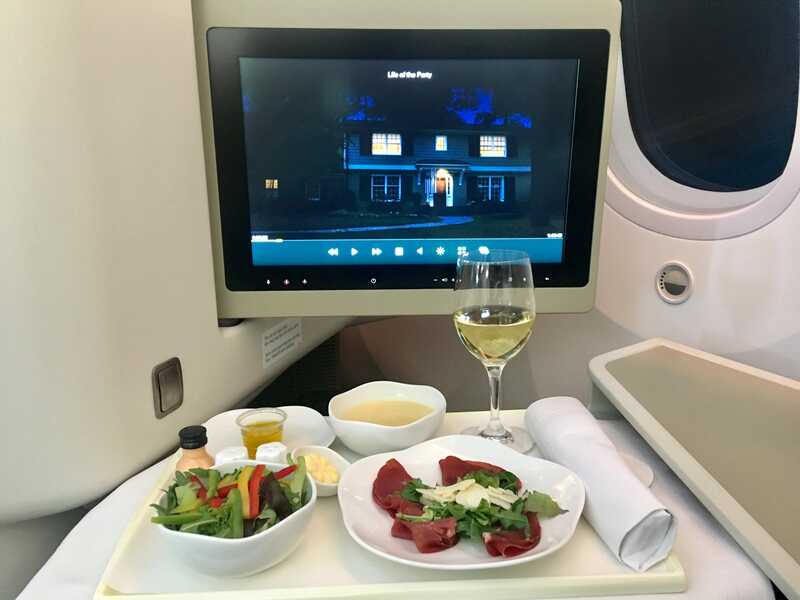 I pulled the 15.4” HD touchscreen towards my seat, searched the collection of movies, music, radio and television programs, and settled on one of the new release films — the comedy “Life of the Party” with Melissa McCarthy — to entertain me during the meal. 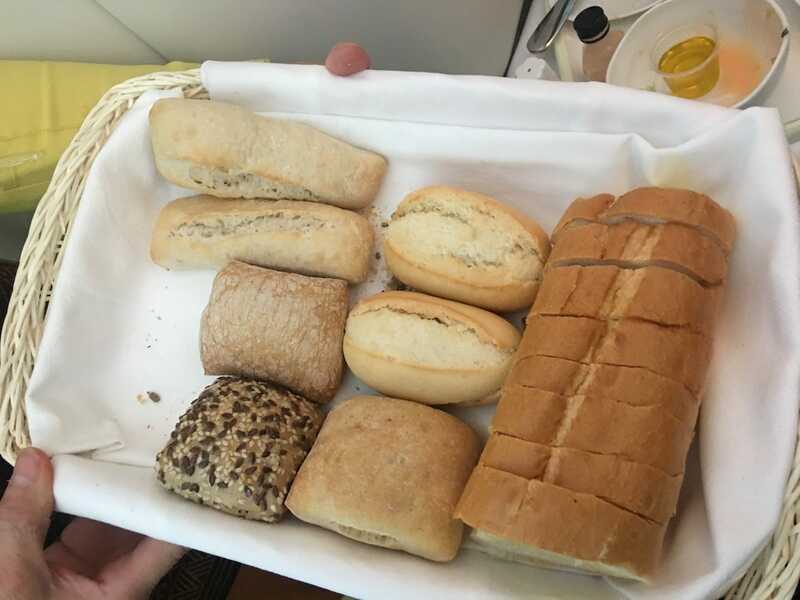 Soon after, the flight attendants provided breads to choose from, including ciabatta, malted grain, sourdough, and garlic bread. 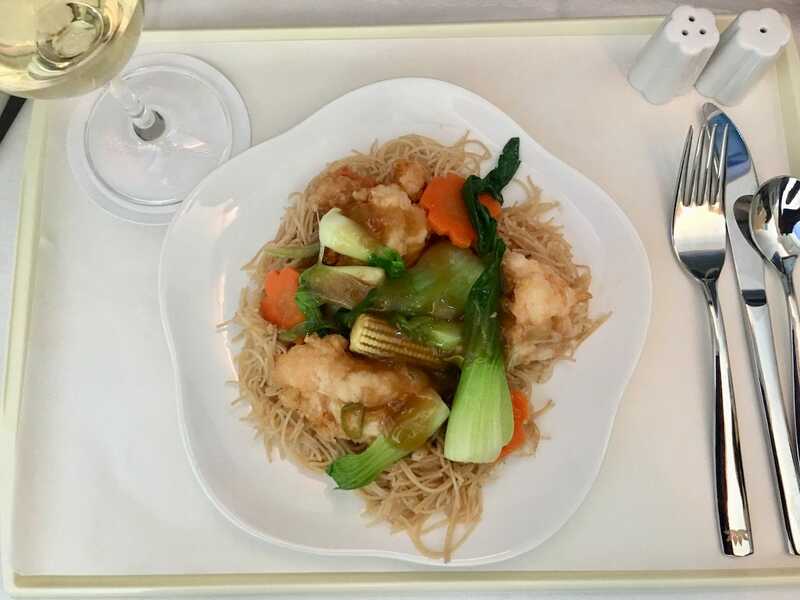 My main course selection was the Vietnamese-inspired stir-fried prawns with ginger and onion sauce on a bed of rice noodles. It was pretty decent. The main course was later followed by a tray of select cheeses and accompaniments. 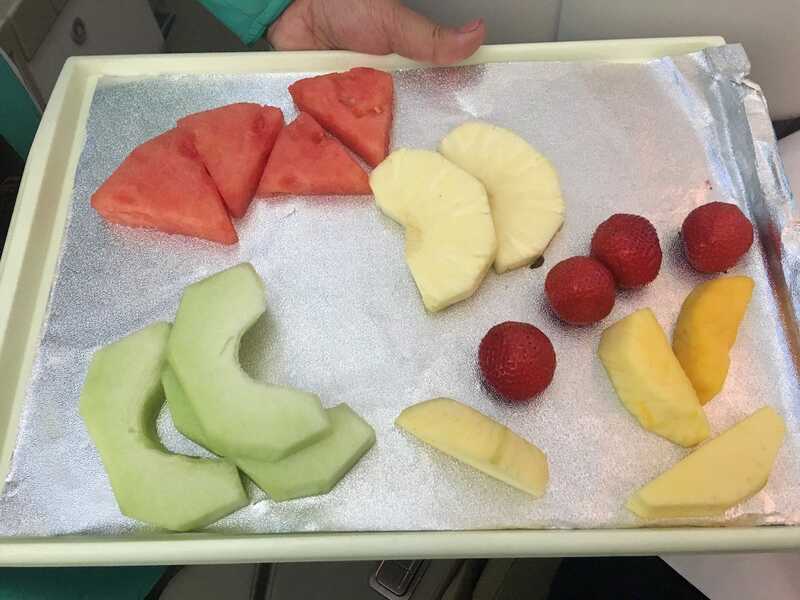 A separate tray of melon, strawberry, apple and other fruits was also offered to passengers. 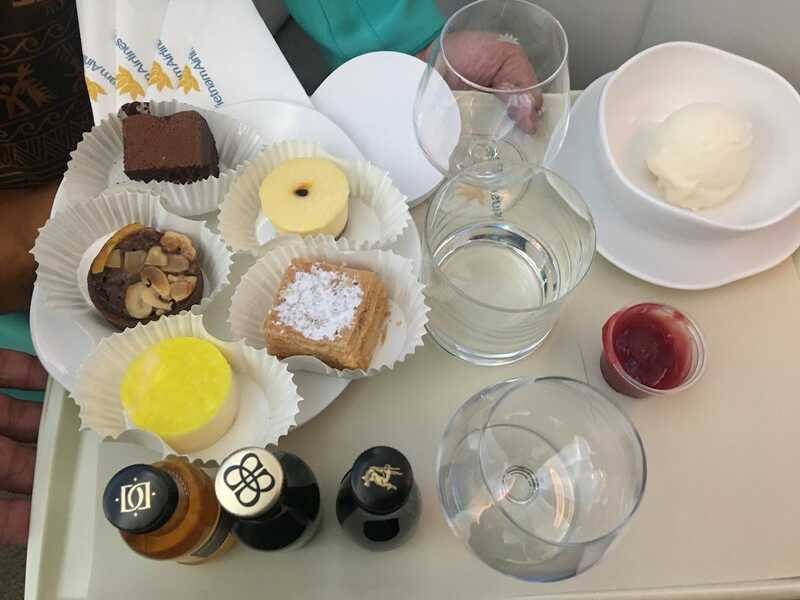 The lunch service concluded with a choose-what-you-please selection of petit four-sized cheesecakes, chocolate brownies, and other pastries, as well as coconut ice cream with raspberry sauce. 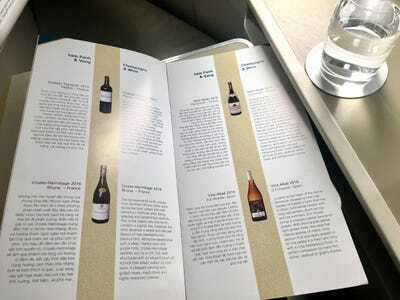 There were also miniature bottles of digestifs including Cognac and Bailey’s. Tea and coffee orders rounded out the meal. After a substantial meal and a few television programs, I put the lie-flat bed into good use. 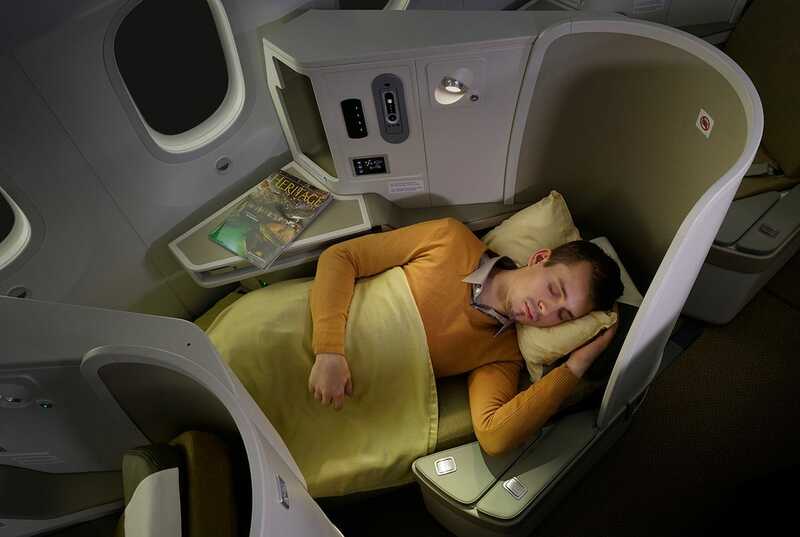 I didn’t get the same serene, restful sleep as the guy pictured here, but that was more due to my own wonky body clock — the lie-flat bed itself was comfortable and accommodated my six-feet-tall frame. 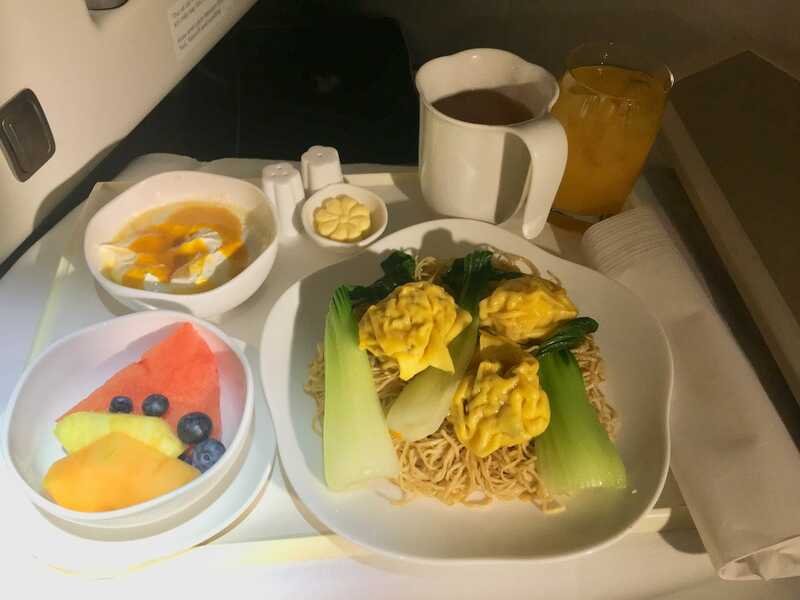 I was already half awake when breakfast service commenced, and I ordered the crayfish dumplings with stir-fried wonton noodles. The tray was accompanied by yoghurt, fruit, juice, and tea. Attendants also offered warm pain au chocolat pastries for the cabin. Even with the delay in boarding, the plane arrived on-time at Hanoi’s Noi Bai International Airport at around 4.50 a.m.
With the only business class product flying between the UK and Vietnam in one fell swoop, Vietnam Airlines provides a convenient, comfortable, and well-serviced experience for business class passengers travelling between London and Hanoi – or Ho Chi Minh.